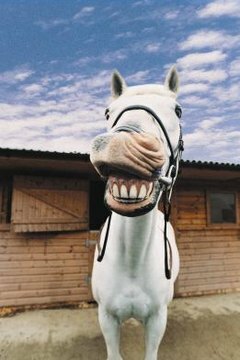 If you have never had your horse's teeth floated, he probably could use a visit from the equine dentist or vet. Horse teeth wear at an uneven rate, and can develop sharp points that cause pain while your horse is eating or being ridden. Mild cases may make the horse slightly cranky, while a horse who badly needs his teeth floated may not be able to eat, and may react violently when you attempt to bridle him. One of the easiest ways to tell if your horse needs his teeth floated is to determine when they were floated last. A horse under 10 years of age will probably need his teeth floated about every six months. After the age of 10, tooth eruption slows down significantly, and your horse will probably need his teeth floated only annually. Seniors typically don't need to have their teeth floated any more frequently than once a year, but they can develop problems quickly due to uneven wear, so it is best to have their teeth checked for problems every three to six months. You may notice some peculiar behavior in your horse if he needs his teeth floated. He may drop his food while he is eating, he may chew the bit or toss his head while you are riding him, and he may shake his head frequently. You may also notice balls of chewed hay or grass in his stall. Leaving these around is called quidding, and is a sure sign that your horse has issues with his teeth. A horse who needs his teeth floated can develop some very specific health issues. He may lose weight, due to his inability to properly chew and digest food. You may even notice undigested particles of feed in his manure. You may notice an unpleasant odor coming from his mouth or nostrils, swelling in the face or muzzle, or nasal discharge. If you notice any of these symptoms, it is important to have your horse's teeth floated as soon as possible, as they can lead to longer-lasting health concerns such as sinusitis. Many different physical signs indicate that your horse may need his teeth floated, but even if he doesn't demonstrate these textbook symptoms, you may want to have an equine dentist or vet check his mouth. Your horse may not have severe-enough problems to cause difficulty eating or head-tossing, but he may still be uncomfortable. Perhaps one of his molars has a sharp point, and he occasionally pinches his cheek between the sharp tooth edge and the bit. That may make him unwilling to take the bit. If you notice any change in your horse's behavior, consider whether tooth pain could be the cause. C.S.J. Dental Services: What Is Floating?